The British Crown dependency of Jersey is the largest Channel Island, situated just fourteen miles from France, in the Bay of Mont St Michel. Divided into twelve parishes and measuring nine by five miles, Jersey packs plenty of fun into a limited space. Also, thanks to the moderating effects from the Atlantic, it’s one of the warmest locations in the British Isles, attracting beach lovers and keen historians all year round. 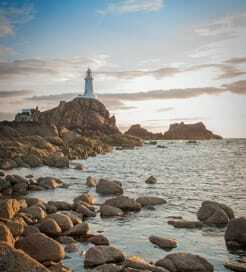 With a strategic location between England and France, Jersey has a long recorded past, stretching over a thousand years, enduring several invasions. However, the turbulent history has culminated in a rich, multi-layered culture with numerous historic monuments. Part of the Duchy of Normandy and Anglo-Norman realm in the middle ages, Jersey possesses a strong French influence today, mostly evident in the place and road names. Arguably the most significant event to shape modern day Jersey was World War II, when the Nazis invaded and formed a slave labour camp. The island’s most iconic attraction was a direct result of the five year occupation: the Jersey War Tunnels. Running over a kilometre long within a hillside, they now hold a collection of galleries and artefacts describing the horrors of the Nazi regime, offering a truly thought-provoking experience. Perfect for families, the Durrell Wildlife Park was the first ever conservation-themed zoo, established in 1959, home to many types of rare animals including gorillas, flamingos and maned wolves, all within a beautiful thirty-two acre park. Guarding the island from Norman invasions six hundred years ago, Mont Orgueil Castle, today, commands an imposing position overlooking the east coast, hiding a fascinating torture chamber, many secret rooms and tall turrets inside its walls. Finally, thrill-seekers can get stuck into some wind-karting, zip-wiring and paddle boarding, while the stunning, sandy beaches are best for simply relaxing in the sun. The capital, Saint Helier, is the point of arrival for ferries to Jersey. 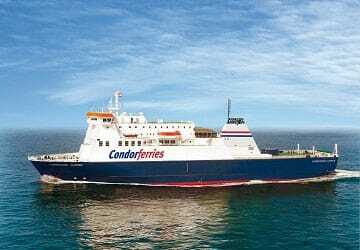 Unsurprisingly, given the island’s position between the two, there are regular ferry routes from southern England and northern France, run by a couple of top ferry operators. You can also hop over from the other Channel Islands Guernsey and Sark. I have recently travelled to France & back via the Victor Hugo from Jersey. This was my second experience & once again as last year, was a pleasurable experience. Yes you have to queue to collect your boarding ticket, but other than that, found the experience to be be very relaxing. The boat crew are very friendly & did not wince carrying my 20k suitcase down the steps & onto the boat. The seats are very roomy & comfortable onboard & there is a basic refreshment bar & duty free to keep you occupied during the 1 hour 5 minute crossing & the staff speak great English, if you are like me & your French is poor! Made to feel welcome & the crew always say goodbye as you disembark & if like me you have bulky luggage, you will find it waiting for you on the quayside when you get off. Perfect!! "Well worth a vist by ferry"
If only there had been better signage at Granville we could have got on the boat without any trouble. Nobody told us to exchange our internet booking with tickets and on the return nobody told us we needed boarding cards. Otherwise, the trip was quite pleasant. For more information, please visit our Ferries from France to Jersey page. For more information, please visit our Ferries from Guernsey to Jersey page. For more information, please visit our Ferries from Sark to Jersey page.